it was built as a hotel, although it never received permission from the government to operate as one, so a rich Greek family bought it and donated it to the church, which used it as an orphanage until the 1970s. Since then, it’s been empty. The building is 101 metres long and around 24 metres high, and appears to be the largest wooden building in Europe (although that’s assuming you choose to decide that Turkey is in Europe, and not Asia… because the Todaiji temple in Japan (Wikipedia page) claims to be the biggest in the world). Just an observation, but if the building had been left alone for 30 years, it would likely be a little more overgrown with vegetation. 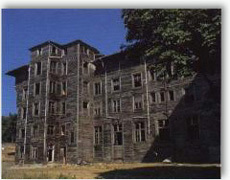 It may not be used as an orphanage any more, but it certainly appears to be relatively well maintained. I’ve been to Todaiji – it is taller (and it looks wider), but not as long. About 50 meters wide by 57 meters deep by 48 meters tall. Looking at that map, the island appears to be much closer to the Asian part of Turkey than the European part – which would put the island in Asia rather than Europe. Also looks like the Turkish government has taken control of the building, over the objections of the Greek Orthodox community. (See http://www.archons.org/news/detail.asp?id=35 — towards the end of the page.) This action has been mentioned in reports regarding Turkey’s application to become a member of the EU (See http://washingtoninstitute.org/documents/41f55d73bea76.pdf). The orphanage at Buyukada figured greatly in my life and my family’s life. I spent 7 years there before coming to the US in 1965. My mother had spent much of her early life there as well. If you think it looks spooky now, you should see it from the inside. Please tell us how we can help Greece win the orphanage back. Greece taking it back? What Greece to do with the Turkish orphanage? Should Turks ask for all the Athens given back to them then? After all, it was part of Turkey for 400 years, am I wrong?